Courier Chess (or Courierspiel) is an historic chess variant, first mentioned in the "Wigalois" a German poem dated from 1205. The famous Dutch painter Lucas van Leyden has represented a game for posterity in the painting shown below. Nowadays, this masterpiece is dated circa 1510. Bell reported that it experienced a tumultuous history during WWII. It can be now admired at the Gemäldegalerie, Berlin, Germany. WWW page made by Hans Bodlaender. Painting sent by Nuno Cruz. Painting of Courier Game. 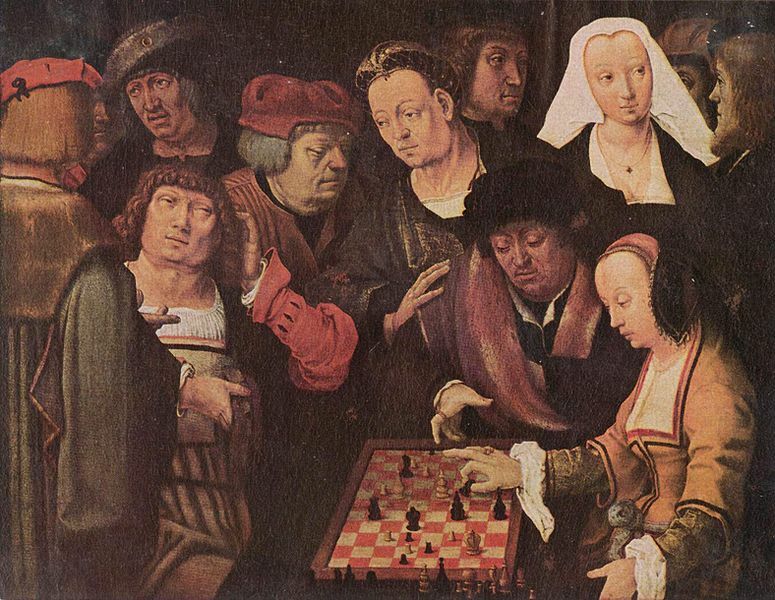 A painting of a Courier Chess game by the famous Dutch painter Lucas van Leyden, from 1510. The man seems to me to be dismayed, and the woman confident. The game has been analyzed. The woman is checking, and can force checkmate in about three moves.